Community engagement is at the centre of Wayward’s projects. From our plant exchanges and adoptions events for unwanted plants, to our community co-design and build workshops, we develop projects that facilitate the exchange of stories, ideas and skills. Since 2006, Wayward has facilitated large-scale plant exchanges and adoption events for unwanted plants, creating funny, warm, meaningful and engaging vehicles to connect people through plants and their stories. Our plant exchanges have emerged in major museums, festivals, farmers markets, throughout our urban garden projects and as an important tool for community engagement and stakeholder consultation. From the intimate rescue of discarded houseplants to the large-scale rehoming of tens of thousands of plants from the RHS Chelsea Flower Show, our exchanges, stories and records are collected on our dedicated site (to launch soon!) House of Wayward Plants. Wayward has mobilised hundreds of volunteers for our community builds, engaging local residents in co-design sessions to envision the potential of their spaces, and skill-building including carpentry, gardening and the upcycling of recycled materials. By opening up the participatory building process, we ensure there is a strong local buy-in and sense of ownership, creating spaces truly grown and built by the local community. We have worked on many projects with complex stakeholders, including major cultural institutions, public authorities, developers alongside local community organisations and resident groups. Through our work, we’ve developed unique methodologies to facilitate radical partnerships between landowners and healthy, established cultural institutions, bringing out one another’s untapped resources to support and foster continued growth. In our project, Park Love - we developed a strategic partnership matchmaking methodology for the US National Parks. In Literalley, we brought together the Whitechapel Gallery, the homeless charity Providence Row and the anarchist bookstore Freedom Books - unlikely neighbours who had not worked together previously - to develop planters for a shared, forgotten garden space. 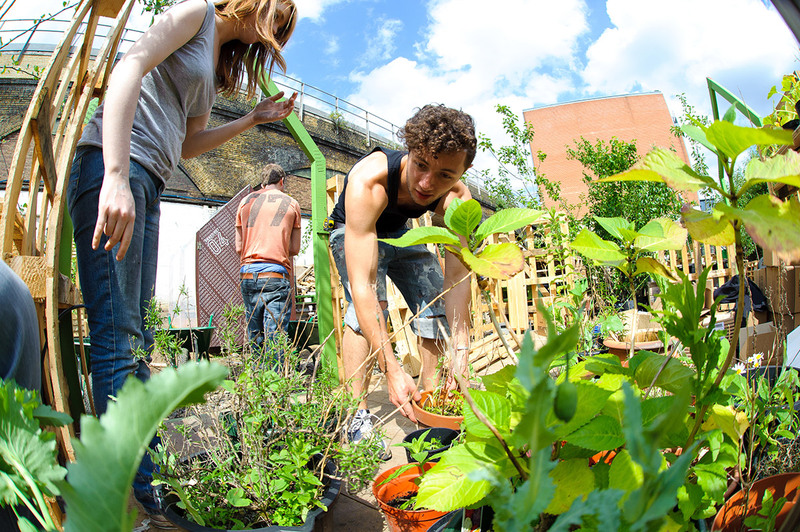 And in the first London iteration of the Urban Physic Garden, we brought together major cultural partners like Tate Modern and Kings College, with local community organisations like Bankside Open Spaces Trust and Living Medicine to create a shared vision that both served the local community and inspired international audiences. We create platforms for collaboration and participation, and love to be part of the life-cycle of a project through its creative direction, curation and activation. We have programmed hundreds of events that bring together our creative networks, from talks and workshops to supperclubs, original performances and film screenings. At Royal Botanic Gardens Kew, in our Spice Exchange pavilion, we curated a summer of events that traversed the Spice Route from East to West, visiting a different world region, featuring speakers, storytellers, performances, food demonstrations and workshops that blended history, mythology, travel and cooking. Projects like the Union Street Urban Orchard and Farmopolis served as incredible social platforms for creative exchange in a series of events that bring together food, farming and culture.